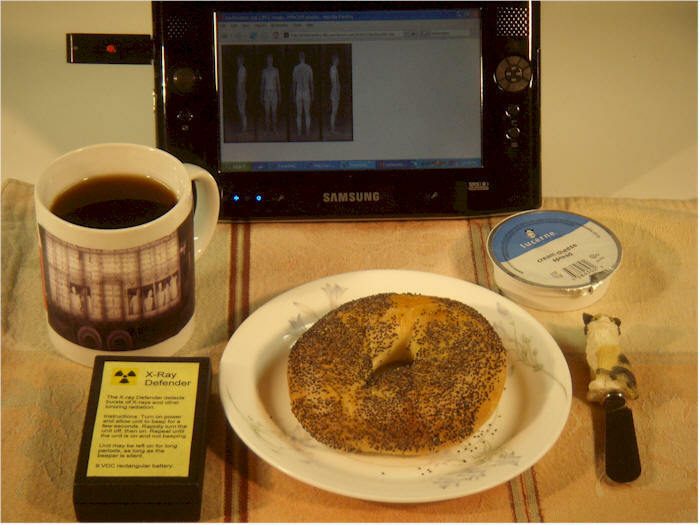 Backscatter X-ray imaging devices have been in the news of late, primarily due to their use in U.S. airports and other public facilities. But, not everyone is aware that the technology is also being deployed in ordinary vans that can image the insides of passing cars and trucks, and even peer into the interior of homes and businesses. In order to penetrate the exteriors of vehicles and buildings, the x-ray beam is substantially more intense. In the wrong hands, the beam could even serve as an undetectable weapon. That is, until now. 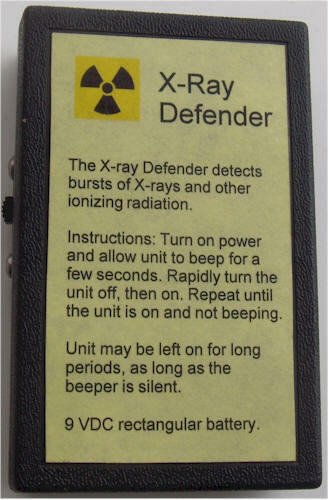 the X-Ray Defender is designed to detect the short, powerful X-ray beam from such scanners, giving the owner time to hightail it out of there, before his hair catches on fire. Remember, the X-rays will zip right through aluminum foil hats, too! The X-ray Defender employs an ordinary PIN photodiode to detect x-rays, instead of light. The photodiode must be kept in the dark, hence the heatshrink tubing sealed with "liquid tape" cap. 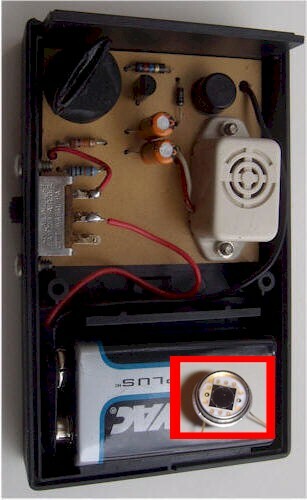 The uncovered diode can be seen in the insert on top of the battery. It isn't clear how powerful the scanning beam is, so it's possible that the photodiode could directly drive the SCR, without any amplification. But, it was decided to enhance the sensitivity, stretch the response to short pulses, and make the device respond only to sudden field changes. The prototype also has a small block of scintillation plastic sitting on top of the photodiode to further enhance the sensitivity, but the beam will almost certainly trigger this circuit without it. The amplifier is intentionally "starved" for current so that it doesn't respond to smaller signals, causing false triggering and the standby current is virtually zero. Here's how it works: The powerful pencil beam of x-rays sweeps across the photodiode, causing a sudden current flow from the diode into the base of the MPSW45. The collector pulls low and current flows up through the 1N5711, clamping the gate of the SCR near zero volts. The dwell time of the pulse isn't known, but this circuit will respond rather quickly. When the x-ray beam moves away, the transistor turns off and the voltage on the collector swings up. The other side of the coupling capacitor also swings up and current flows into the gate of the SCR, triggering it. This slower waveform has plenty of width and energy to trigger a sensitive-gate SCR. The buzzer is simply reset by cycling power, a fairly easy operation to perform while running. When power is first applied, the circuit will trigger. Let it buzz for a few seconds then turn the power off and back on quickly. Try again if it continues to buzz. When the power is on and the unit is not triggered and buzzing, the power consumption is practically zero, so the unit may be left on. The tendency to trigger when power is first applied serves as a circuit/battery check. Component notes: The PIN photodiode in the prototype is an Advanced Photonics, SD200-11-31-241 which has a 0.2" active area. Most other types should work. The high-value 62 megohm resistor provides a path to ground for any leakage and it could probably be left out for even more sensitivity, if there is no significant leakage from the photodiode. Or, a 22 megohm could be substituted. The NPN darlington isn't critical, but it should be a modern small-signal type. The 1N5711 is a small-signal schottky diode but an ordinary silicon diode will also work. The SCR should be a sensitive-gate type, but substitutions are fine. The buzzer is a low-current type designed to operate on 9 volts. The capacitor across it keeps the intermittent current it consumes from resetting the SCR. Keep the unit nearby or build several.